Kirkcaldy counillors Ian and Alistair Cameron want to make the historic Ravenscraig Castle a major attraction for tourists. (Pic George McLuskie). The allocation of of more than £40,000 of funding for visitor improvements at Ravencraig Castle, has marked a major step forward for an exciting new Fife tourism project. The development of the ‘In The Footsteps of the Kings’ initiative, whereby key royal sites and castles are brought to life through an ambitious programme of augmented reality, has the potential to significantly boost tourism in the Kirkcaldy area. Ravenscraig Castle is recognised to be the first fortified casrtle built in Scotland by James II, and is expected to be one of the most visited sites when the ‘Footsteps’ project is fully up and running. And this week councillors approved a total of £42,000 of funding which will be used to make the Ravenscraig Castle site save for younger visitors. The castle site currently has a number of open and unsecure areas that could lead to a fall. Stone retaining walls will be upgraded, new security fencing installed and the steps leading down to the beach from the castle will also be replaced. “We have a hugely significant and historic site which is under used and not really promoted to anything like its true potential,” said Councillor Ian Cameron. 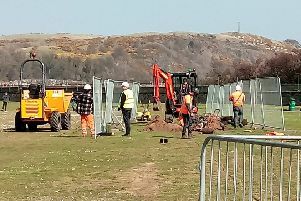 “We want to change that, and this funding signifies the first step in securing the site so that schools in the area can start using the site as part of their curriculum. But as well as wanting to attract more tourists to Kirkcaldy, Cllr Cameron and colleague Cllr Alistair Cameron, who have championed the ‘Footsteps’ project since its inception, say it’s important for local people to buy into the project. “This is a local asset right here on our doorstep, that we should be proud of. “We want the castle to give a sense of place to people living locally, a sense of ownership in it being their castle,” said, Cllr Alistair Cameron. The initial safety improvements are expected to be completed by Spring 2019.